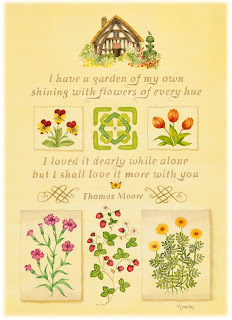 Thomas Moore was an Irish poet who lived from 1779 to 1852, not to be confused with the other Thomas More who became a saint. I came across this poem and decided to incorporate the first few lines into a design, I thought that it expressed a simple truth about the pleasure of sharing. I have always found that gardeners are generous people who enjoy exchanging plants, cuttings, advice and most of all delight in sharing their gardens with others. I planned the design and carefully arranged the elements around the text and proceeded to paint the design in watercolour. Only when it was finished did I realize that I had misspelt Moore, you guessed it, I gave it one "O" instead of two. All was not lost however, Photoshop came to my rescue and not for the first time! The Neale M Albert Collection of Miniature Designer Bindings is now on exhibition at The John Rylands Library in Manchester. If you have not yet visited this newly refurbished, iconic library, let this exhibition be your motivation - you will be enthralled. Over 250 exquisite, creative and beautiful miniature books are now on show in the Historic Reading Room until the 18th October. 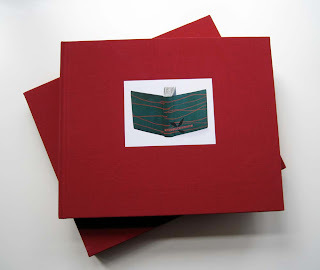 There is also a rather sumptuous, full colour catalogue to accompany the exhibition, see above. All types of styles are featured from the traditional to the experimental, each one a unique work of art in its own right. 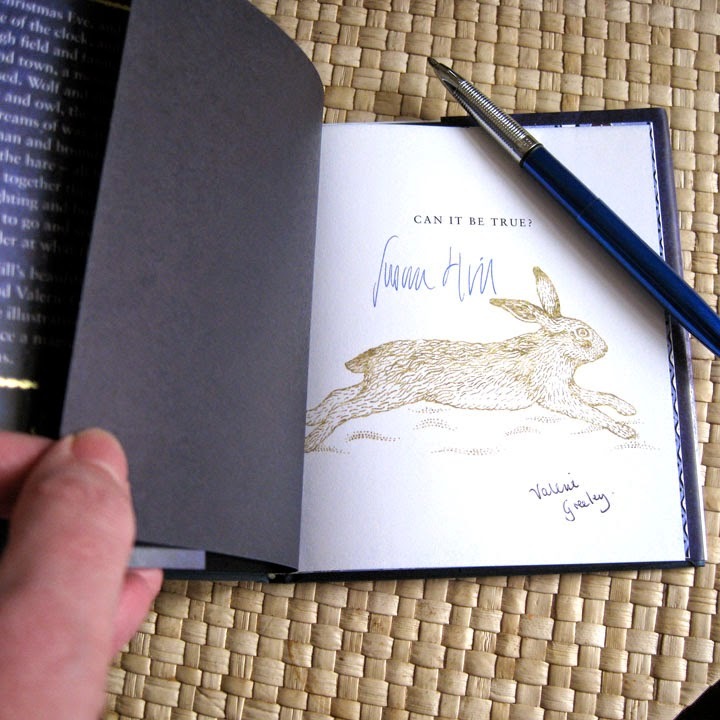 Many of them are the work of Fellows and Licentiates of the Designer Bookbinders Society. Alongside the books you will see equally wonderful boxes and cases which have been especially created to contain these tiny treasures. 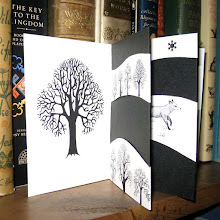 Rachel Ward-Sale is one of the Fellows of the Designer Bookbinders whose work is being shown. 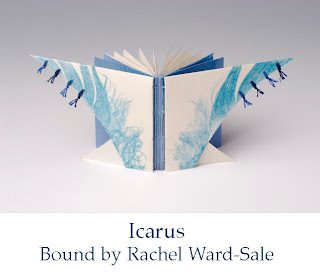 She has very kindly given her permission to feature her binding "Icarus" which measures just 55 by 70mm. When you first look at this tiny treasure it is difficult to believe that human hands have made such a delicate creation. Rachel said "The book was so small and light that I wanted to avoid using a conventional structure which would restrict it. As the title naturally suggested flight I designed folded vellum boards shaped like wings and printed with feathers, held together with silk tassels." 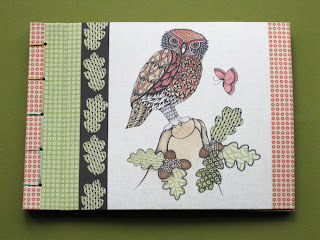 You can see more of Rachel's work on her website Bookbinders of Lewes, the gallery section is well worth a visit. I always feel slightly sad when I find that we have reached the longest day. The long daylight hours make me feel that I can achieve so much more, as I get older this effect on my spirits seems to be stronger. I am sure when I was young I never paid much attention to such matters. 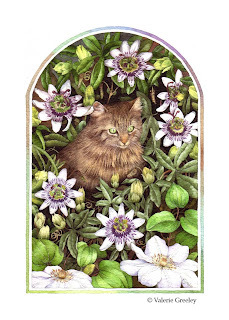 The painting below shows my passion flower and my neighbour's cat, both now deceased I'm sad to say. I bought the plant at a church sale for ten pence, it was a tiny cutting in a plastic pot. I planted into my garden and it scrambled up the wall in no time at all. For the next two summers it was a delight. I'm not sure where I went wrong but it never made it through the next winter. Maybe I should have taken cuttings and brought them inside? Ah well, you live and learn. Do you remember how hard it was when you first tried to create a blog? 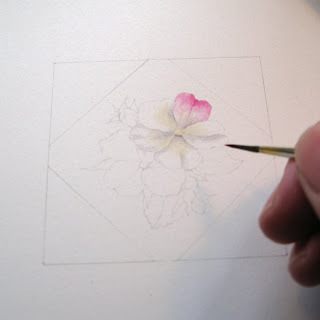 My artist friend Patricia Shea has started her own blog, I know it will be wonderful, she would appreciate any help, advice or encouragement from fellow bloggers. Her site is called pattern patisserie, with a name like that she is bound to succeed! I have been doing quite a bit of experimenting with various inkjet coated fabrics, with varying degrees of success. 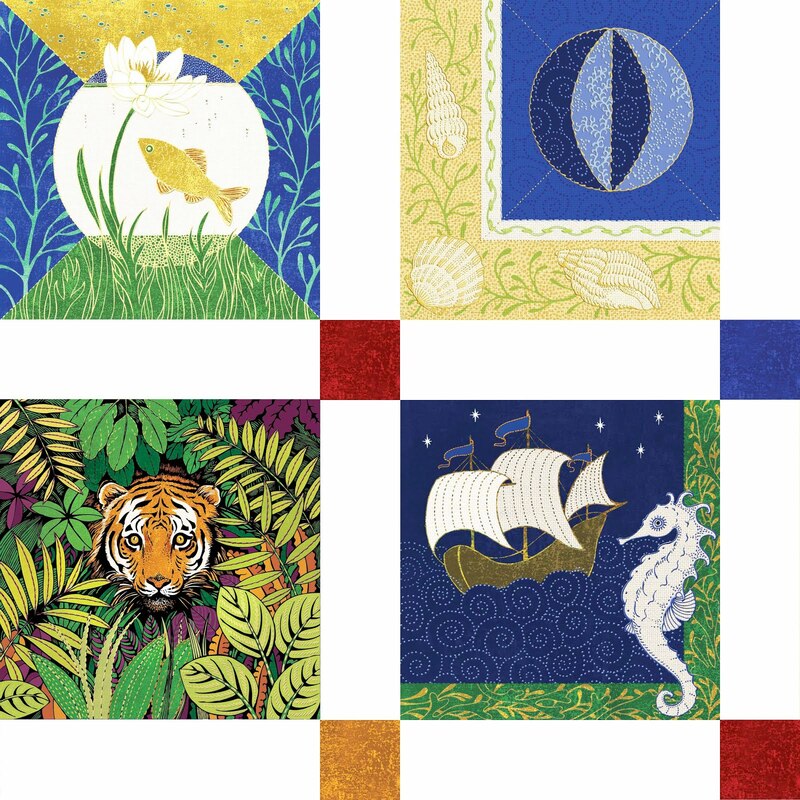 I have found that by printing directly onto the fabric the effect is much better than the iron-on type of medium which has been around for some years now. By creating patterns on Photoshop, using my original hand drawn design, I devised this decorative cover for a small album. 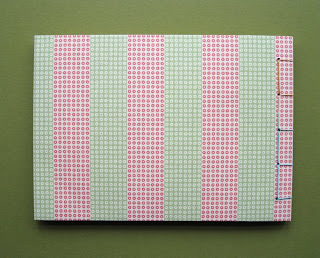 I used a Japanese style stab binding using some lovely hand dyed linen thread which I bought on a recent trip to Faulkiners. On the whole I was pleased with the result but can see room for improvement. My other attempts are in my wheelie bin! 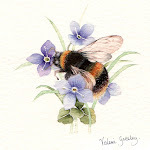 There are so many flowers in bloom at the moment it's difficult to choose which one to paint. I try to photograph as much as I can for future reference although it's always much nicer to draw from life. This Ballerina rose is a great favorite of mine, please ignore the aphids and blackspot, I hate to spray unless I have to. I cut a small piece of this plant and sat it on my desk, a multitude of creepy crawlies crept out! Ever since I visited Erasmus Darwin House in Lichfield, I have been trying to grow herbs with varying degrees of success. The herb garden in Lichfield is exquisite, all the better for being enclosed, it reminds me of a secret garden. My herb garden is tiny, I have mint, parsley, thyme, chives, basil (from the supermarket!) and sage. A campanula has crept in but I allow it to stay as it looks pretty. Chives do very well, they grow next to my Dublin Bay rose and I have just learnt a new saying; "chives next to roses create posies", it seems that they help prevent black spot. 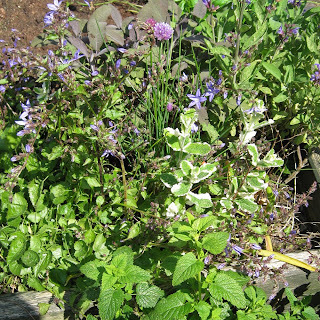 I planted sage last year and it survived the winter, it's now in flower, a lovely shade of purple. Sometimes my garden, albeit very small, seems overwhelming, everything grows so fast and it is a constant battle to keep things in check. 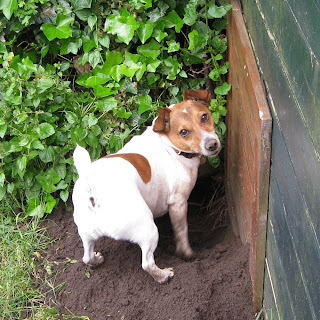 I do have one helper however, especially good at digging and that is my Jack Russell, Ted. I am not sure what he was looking for but he certainly enjoyed himself! 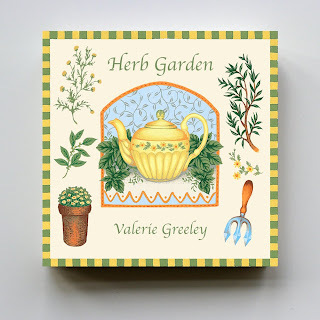 The nice thing about growing herbs apart from the fragrance and taste, is that they make very good subjects for my designs. 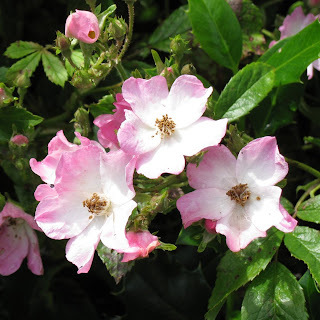 I have a rose that climbs a trellis in my garden, it blooms every year in June, despite neglect on my part. 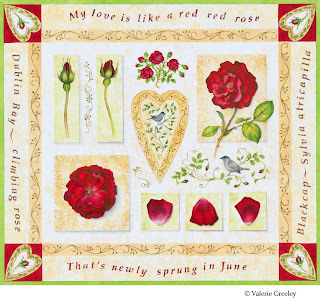 It has the most beautiful deep red, velvety petals and is called "Dublin Bay". I wonder how it got it's name? "A cuppa" interview with Patricia Shea. This is the first in what I hope will be a series of interviews with inspiring and creative people. Working freelance is often a very solitary way of life, opportunities for meeting others are few and far between and therefore all the more precious. How nice it would be if the friends that I have met lived near enough to pop around for a cuppa! 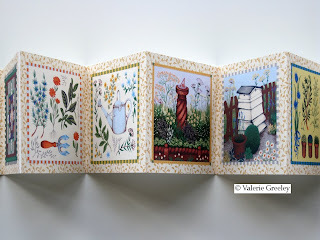 I first met Patricia Shea whilst exhibiting at Surtex, a mutual friend introduced us over a cup of tea. I have grown very fond of both Patricia and her work over the years and we have kept in touch by email. Although we both studied at the same art college and did the same course, we were in different years and by the time we met Patricia was living in the USA. 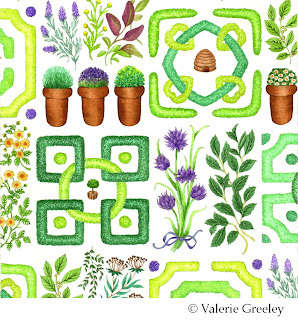 I find Patricia's work inspiring and exciting, I love her sense of colour and pattern. I would like to take this opportunity to invite you to join us for a cuppa! Q1. 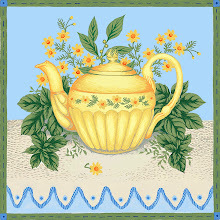 How do you take your tea and in what kind of cup do you like it served? A1. I really like a good strong cup of loose Irish Breakfast tea with just the right amount of half and half (do you have that in Blighty?) I prefer my tea in a mug to a cup but my fave 'vessel' right now is halfway between the two and it has a lid to keep the tea warm whilst you work. 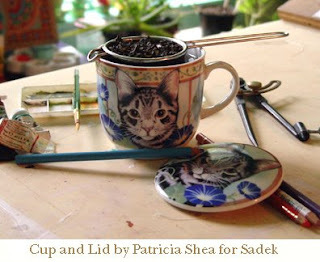 see pic 'cup and lid').It actually features one of my designs and was made by Andrea by Sadek, sadly it isn't available anymore but I did just feature that image on some items at my Cafe Press store. Q2. If you could choose anyone, past , present or future, who would be joining us for tea? A2. I think my choice would have to be Alphonse Maria Mucha who had the uncanny ability to combine art/design and illustration in a perfectly cohesive and spectacular way. I never know if I am a designer, an artist or an illustrator and I look to Mucha to help me figure that out. I frequently refer to his work for inspiration and am constantly awed by the exquisite beauty of his line and his delicious textile design-like repeats. Q3. Tell me a little about your background in art and design. A3. I have done artwork of some kind all my life starting as soon as I could pick up a pencil. As a child I was crazy for paint-by-numbers and spirograph both of which have greatly influenced my work...I always feel the gripping need to stay within the lines and I love the consistency and repitition you achieve with spirograph, certainly helps with repeat patterns! I attended Manchester Poly. for Textile Design and to be honest dropped out after my first year which is ironic as I ended up in New York running the Textile division of a big company there who let me learn everything on the job, how INCREDIBLY lucky am I? 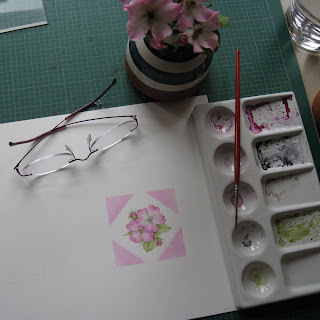 When I decided to leave the textile job, due to lack of creative fulfillment, to go freelance in NY I veered more towards home decor and did a lot of designing for porcelain companies as well as for paper products. Q4. Where are you based and does it influence your work? A4. I am based in Belfast, Maine USA. 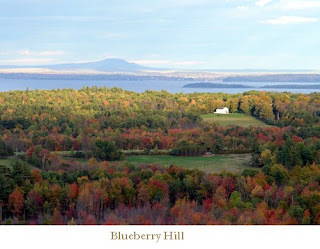 (See pic 'blueberry hill')...a view from the top of the blueberry barren next to my house) It is a lovely little coastal town at the top of Penobscot Bay which is a very beautiful part of the world. It's influence on me is somewhat abstract in that the beauty of the area doesn't show up directly in my work but it does put my mind and emotions in a very good place to be creative. The winters here are truly brutal....many days you don't even go out of the house and that certainly gives you a lot of time to really get down to work!!! In winter there is NO colour here and I find my artwork getting brighter and brighter in direct response to that lack. Q5. What have you been doing/working on today? A5. Today I have been finishing up what I call a "Daydream Mandala"( See pic 'daydream mandala')...this is kind of my fun/play work that I do to meditate...again it is a grown up combination of spirograph and paint by numbers...I figure out the repeating design, transfer it to a large circular piece of MDO and then fill in the shapes...being very careful to stay within the lines. 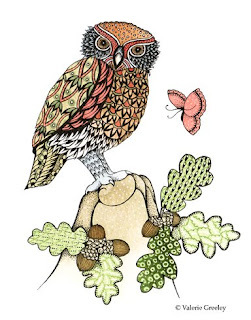 My illustration work really requires my complete attention and every step of the way deicisions have to be made...with the mandala work all I have to do is decide on the colours and fill the shapes in....I find it very rewarding and relaxing and it gives me time to think about my daydreams. Q6. I hope that you have brought along something wonderful to show us, what is it? A6. 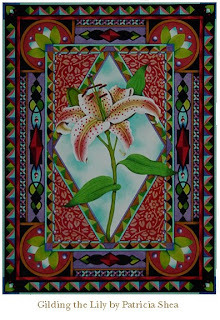 This is one of my favourite watercolour paintings...(see pic 'Gilding the Lily'....ha ha!) I did it for no reason other than I wanted to see it exist. I haven't used it for any purpose other than to inspire myself with the possibility of being able to do what Mucha did with art/design and illustration combined. Thanks for calling round for a cuppa Patricia! When I am rich and famous, or maybe when I win the lottery, I am going to commission you to make me one of your fabulous couture rugs! The landscape in Maine looks beautiful, lucky you. It's a shame the pretty cup is no longer available. I am sure we will be seeing much more of your work soon. 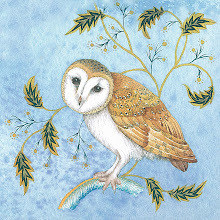 To see more of Patricia's work you can visit her website. She also has a Cafe Press shop. 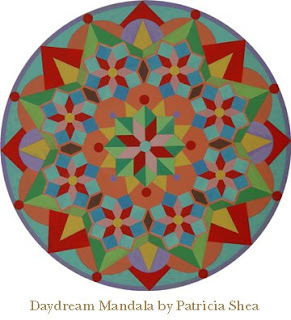 Patricia's partner James Strickland is also an artist with his own website. All worth a visit.